Super Bowl 2016 is just around the corner as it will take place on Sunday, 07th February 2016 at the Levi’s Stadium in Santa Clara, California. CBS has the broadcasting rights for historic 50th edition of Super Bowl and they will have extension coverage in the week leading upto the biggest american sporting event of the year. The two teams participation are yet to be confirmed since the playoffs will be played in January but we do have a complete list of halftime show stars and their performances. Back in november 2015 it was announced that british band “ColdPlay” will headline the 2016 Super Bowl Halt-time show. Chris Martin’s friend Beyonce also confirmed for the 2016 halftime show. 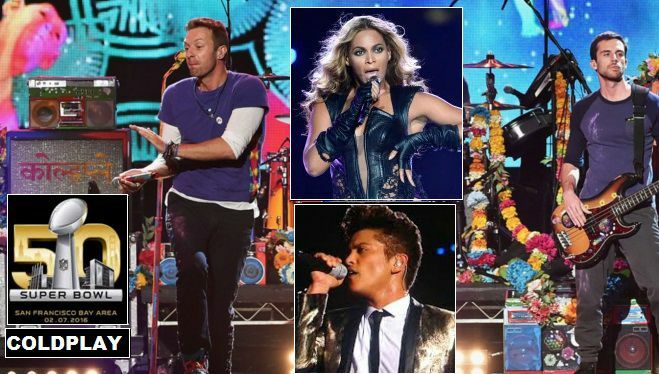 Super Bowl has also invited “Bruno Mars” to perform alongside Coldplay and Beyonce. It is yet to be confirmed that whether he will take some part but there is a pretty good chance he will be seen in Super Bowl Haltime show for the second time in 3 years. Here is the confirmed and rumored Halftime show stars and performers for the 2016 Super Bowl. The 50th edition of the big event.